The first printer to turn everyday receipts into marketing and customer-retention tools. 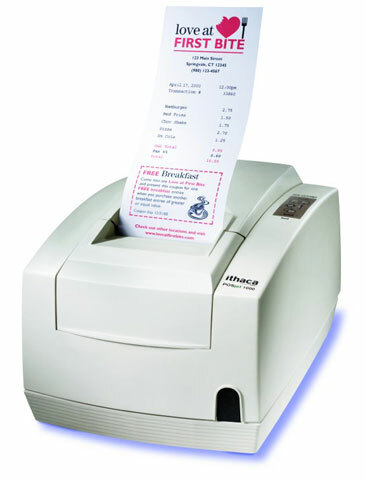 The POSjet 1000 Color Inkjet POS Printer offers a first for the industry: the ability to print inkjet-quality color graphics logos coupons and special offers on your transaction receipts -- affordably. This 12-lps printer features HP inkjet technology and our Insta-Load automatic paper loading system. 42521	 Ithaca POS Paper, 3" width x 300' length impact paper. Single roll. The Ithaca PJ1-P-1 is also known as Transact Ithaca	ITH-PJ1-P-1	or PJ1P1	.